Here’s our Manta Trawl alongside Boaz. 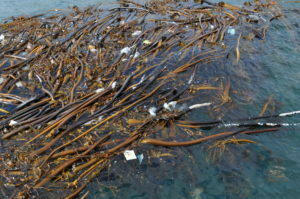 It’s not designed to clean the oceans, but to sample them so we get an idea of what is floating out there. We trawl along the Sea Point coastline, which is heavily populated, and has foul sewers and stormwater drains spilling directly into the ocean. 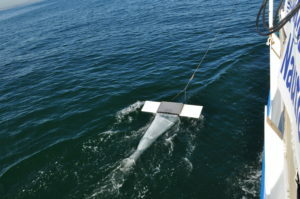 The trawl is 600 mm wide, not much, but it does give a representative sample of the floating pollution. This ‘collection’ on the left is only too often found. 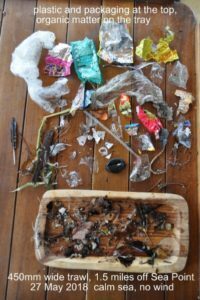 Floating plastic is seen as we sail along – this collection was from a sample of 600mm wide and about 2 km long, our trawl coverage. Just multiply this by say an area 50km long and ten wide, perhaps the extent of the coastal waters parallel to the Peninsula (over 400 million times as big as the sampled area) and think of how much plastic there must be out there. Okay, so the distribution may not be equal over that bigger area, but we only sample the surface. How much do we miss a metre deeper, and how much is on the bottom? The picture on the right is a knot of kelp found about a mile off Clifton beach. It’s caught a lot of floating plastic.